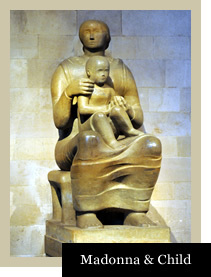 Henry Moore’s Madonna and Child is a work of international significance. The sculpture is in Hornton stone and was carved for the church by Moore in 1943-44. It is the gift of the first Vicar, The Rev'd Canon J Rowden Hussey, and stands in the north transept near the Lady Chapel. sculpture is positioned. The base, which is constructed of a number of layers, contains a time capsule holding newspaper cuttings of the sculpture’s installation and, following the work’s most recent return from exhibition, details of the present incumbent’s institution and induction service. Moore respects his medium, and has kept within the best traditions of sculpture, especially that of the ancient Gothic and Catalan carvings. At the same time the work displays his own technical mastery of form and rhythm. As is often the case with great art, sustained viewing yields many insights. The longer and more often the statue is studied and reflected upon the more vividly and unforgettably is the sculptor’s conception realized. The artist has sought to express what we know Christ and his mother to be, rather than what they may have looked like to their Palestine contemporaries. One is struck by the solidity of form. The Holy Child is the central feature of the composition; a small prince, Christ the King enthroned on his mother’s lap and nestled down between her thighs. The Blessed Virgin is depicted as a mother would appear to her child - the one great secure background to life. Notice the relative proportions of her face and feet. Her faithful obedience in accepting God’s invitation to be the Mother of his Son makes hers the highest achievement of humankind. In fulfilling her astonishing vocation she expresses all the possible dignity and majesty of humanity. Mary is here depicted as a strong ‘earth’ mother, yet at the same time there is also tenderness and humility. Her touch is gentle. A sense of loving understanding, of knowing, is conveyed as she holds and protects her divine Son without any suggestion of restraint. Her gaze, also that of the child’s, points forward into the distance, envisioning perhaps what this child is to become. She offers him to all ages and to all people who shall come to him. Apart from God, he is also her gift to the world. Everyone wants to touch sculpture, to connect and interact with it, and make sure it's real. The Madonna’s knees have over the years become darkened and shiny where visitors have done just that. Henry Moore has entered into the spirit of this place, and with fundamental and profound simplicity created a great and beautiful work of art which tells us of the beauty of God, and leads us into a relationship of prayer and contemplation with him. To appreciate the work as a whole within its setting the statue is best seen, at any rate for the first few minutes, from close beside the pulpit. "And now God says to us what he has already said to the world as a whole through his grace-filled birth: "I am there. I am with you. I am your life. I am the gloom of your daily routine. Why will you not bear it? I weep your tears - pour out yours to me, my child. I am your joy. Do not be afraid to be happy, for ever since I wept, joy is the standard of living that is really more suitable than the anxiety and grief of those who think they have no hope… This reality - incomprehensible wonder of my almighty love - I have sheltered safely in the cold stable of your world. I am there. I no longer go away from this world, even if you do not see me now. I am there. It is Christmas. Light the candles. They have more right to exist than all the darkness."